Cashback Reward : Earn up to 74$! 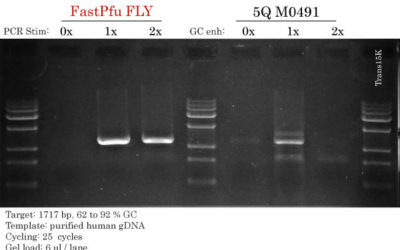 TransTaq DNA Polymerase High Fidelity, also named TransTaq HiFi DNA Polymerase, contains TransTaq®-T DNA Polymerase and a second proprietary DNA polymerase possessing proofreading 3’-5’ exonuclease activity. 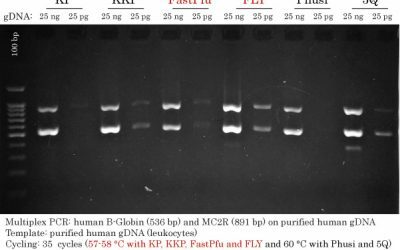 TransTaq HiFi DNA Polymerase provides higher specificity and amplification efficiency than TransTaq®-T DNA Polymerase. It provides two different buffers for optimal PCR conditions: TransTaq® HiFi Buffer I is optimized for the amplification of genomic DNA and TransTaq® HiFi Buffer II is optimized for the amplification of λDNA, cDNA or plasmid DNA. Available with or without 1 ml of 2.5 mM dNTPs for convenience.